As we have had many additions to this e-list: Pine Knoll Shores is very fortunate (along with the other beach towns of Bogue Banks) to have the very best Beach Manager in North Carolina in Greg “Rudi” Rudolph. He is responsible for monitoring the health of our beach, managing renourishment projects, working with a myriad of local, state, and federal agencies, and doing just about everything possible to keep the beaches looking the way they do. Rudi puts out a quarterly message that is published in the Island Review magazine. We forward it from Town Hall as well. It is also on the County Shore Protection Office Website. Attached is Rudi’s annual Hurricane Preview. It is worth a read to see what the forecasters say is in store for us, and to refresh you on how we categorize storms. Hi, just a reminder that you're receiving this email because you have expressed an interest in receiving electronic communications from Carteret-Craven Electric Cooperative. Don't forget to add enews@ccemc.com to your address book so we'll be sure to land in your inbox! Most of us are no strangers to hurricanes along our coast, but we still need to be ready to evacuate if necessary. Store supplies so you can grab them quickly if you need to evacuate; know in advance what else you will need to take. 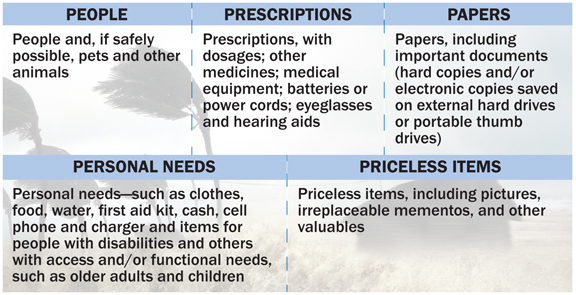 Take time now to make a list of the things you would need or want to take with you if you had to leave your home quickly. Need help in deciding what to pack? Click here. Store the basic emergency supplies in a "Go Bag" or other container. Can't get through on the phone to report your outage? The cooperative's Supervisory Control and Data Acquisition (SCADA) system is the heart monitor of our electric system and provides real-time information on outages at the substation level. Staff members monitor the SCADA system constantly and dispatch crews to fix problems and restore power. Please be patient during storm outages. If you can't get through on the phone, you can report your outage online here. You can find outage information and restoration progress by following us on Facebook or staying tuned to local news media for regular updates. 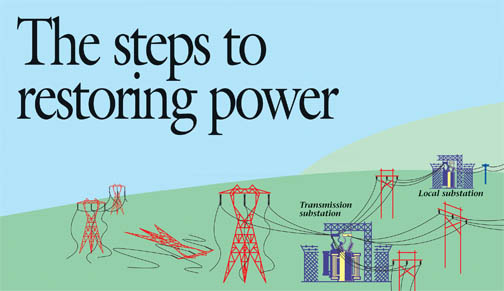 Click here for a short video on how CCEC restores power after major outages. If you want to connect a generator to your home's main electrical supply, you need an electrical permit. You need to be sure a double-pole, double-throw transfer switch is installed. In the past, Pine Knoll Shores has used a siren system to notify citizens of emergency situations. In this world of internet, email and cell phones, a siren system seems to be antiquated, and we have decided we can get alerts to the residents more efficiently through the county’s CodeRED emergency notification system. The switch over will be effective with the 2015 hurricane season, beginning on June 1. CodeRED is a communication service that allows Carteret County Emergency Services (CCES) to quickly notify residents and visitors about emergency and health situations. Emergency notifications or health alerts can be sent out via landline, cellular phone, text message or email, and can be customized to send messages only to specific neighborhoods or to the entire county. It is important to note that the CodeRED alert system is activated only in the event of a natural or man-made disaster or emergency. Pine Knoll Shores has negotiated an agreement with CCES to send out town-specific alerts in addition to county-wide notifications. A Pine Knoll Shores-only notification would go out at the request of PKS Emergency Management personnel. CodeRED is an efficient system for alerting large numbers of people in a short period of time. All residents are encouraged to register with CodeRED if they have not already done so. Simply go to the county’s website at carteretcountync.gov and click on “Emergency Notifications” under CodeRED. If you do not have access to a computer, you can contact CCES by phone at 252-222-5841. Registration is free and you will not be charged for notifications. If you have questions related to CodeRED, please contact CCES at the above number or contact Fire Chief Jason Baker at 247-2268, ext. 30, via email at jbaker@townofpks.com, or stop by the Public Safety Building. The proposed budget for FY 2015-2016 for the Town of Pine Knoll Shores has been presented to the Board of Commissioners and is available for inspection in the Town Hall Monday through Friday from 8:00 a.m. to 4:30 p.m., at the Bogue Banks Library during regular hours, and on the Town’s website. The Board of Commissioners will hold a public hearing on Wednesday, June 10 at 6:00 p.m., or as soon thereafter as possible, on the proposed budget in the Pine Knoll Shores Town Hall Board Room, 100 Municipal Circle, for the purpose of receiving comments on the proposed budget. Persons wishing to be heard are invited to make written or oral comments. One of the most important items of business for storm readiness in PKS is communications. The best storm plan in the world is not worth the paper it is printed on if we do not have a reliable mechanism to get the word out. This message presents 5 items related to communications that are important when it comes to Emergency Management in Pine Knoll Shores. 2. Visit the Town Facebook Page- every message passed in the areas mentioned in 1. above is also posted on the Town’s Facebook Page: Facebook.com/townofpineknollshores In the event that Town Hall loses its internet connection and cannot send emails (as we did during our most recent major storm), we will use a wifi hotspot and post our messages directly to Facebook. Reminder—you do not need a Facebook account to view these messages…just enter the link shown earlier in your browser. 3. Sign up for Code Red- We have decided to abandon our siren system in town. A much better way for everyone to be immediately notified of an important event or an emergency is to sign up for CodeRed, which will call a home phone or cell phone (or both). You have to go the County website to enroll in CodeRed: www.carteretcountync.gov. 4. Have an AM Radio so you can listen in on 1610, the PKS Town Radio Station- The Town has a 5-watt radio station which will broadcast emergency messages. The same messages which go out on email and are posted on Facebook are also broadcast on 1610 AM, so in the event your home has no phone/power/internet capability, you can still get the word. 5. Call Town Hall to get the latest word prior to driving to PKS after a storm event- The same messages which are sent out on email, posted on Facebook, and broadcast on 1610 AM are also read on our message machine at Town Hall when we actually encounter a hurricane event. It’s a good idea to call and check out the status in Town before driving here from several hours inland only to be turned around. Call 252-247-4353. Hurricane Season starts on 1 June. The staff of Pine Knoll Shores has compiled a list of useful information to help us all prepare for what we hope is a nice long summer of calm weather. We care about our citizens and want everyone to be prepared. Below are useful links for storm preparation. www.nhc.noaa.gov. This is the National Weather Center which has Doppler radar, hurricane tracking, etc. I would encourage you to visit this website and save it under your favorites. www.ready.gov/natural-disasters. This is a FEMA website with information on how to get prepared for storms. It has information such as evacuation plans, and putting together hurricane preparedness kits. I would encourage you to visit the website and save it to your favorites as well. www.carteretcountync.gov. This is the county website, on the main page go to Services at the top. This will bring you to a page with different departments, forms, services, etc. offered by the county. In the first column you will see Emergency Services, click on it and it will bring up the emergency services page with a contact heading and an important information heading to your right. CodeRED is a telephone communication service that allows the county to quickly notify citizens and visitors about emergency and health situations. All are encouraged to register. There is a link to do so. Carteret General Hospital operates a shelter for persons with special medical needs at the Leon Mann Enrichment Center. This facility is located at 3820 Galantis St., Morehead City, NC. Persons wishing to use the special needs shelter must pre-register with Carteret County Emergency Services. You can contact Carteret County Emergency Services at 252-222-5841. There is also other useful information on the county website and contact information or you can contact Natalie Gibble at Pine Knoll Shores Public Safety, 252-247-2268. Again we want to stress to you the importance of being prepared and not waiting until a threat arises. If you have not stopped by the Public Safety Building and obtained your re-entry pass, we would encourage you to do so as soon as possible. Do not wait until there is a threat of a storm. You will need to see Natalie Gibble to obtain your pass. Natalie is in the office Monday-Friday 8-4:30 and would be glad to assist you. She is also at cc: Reminder: There is a $25.00 fee for replacing a previously issued pass. If you have any questions regarding any of the information above, contact Natalie at 252-247-2268 ext.10. The May issue of the Shoreline is now available online!